Mmmm..Mexican food! I could eat Mexican food every day and is one of the main reasons why I love traveling to Mexico. We'll be back in about 5 months, but in the meantime I try to satisfy my cravings by hitting local Mexican places or cooking it myself. Last night I made chicken enchiladas with a tomatillo sauce. I visited the local Mexican market for some authentic ingredients like the corn tortillas from Mexico and the powdered cheese. Tomatillo Sauce - I found the recipe for the sauce on epicurious.com. It was part of an enchilada casserole recipe, but I only used the recipe for the sauce. I made about half of what is listed below. Mix tomatillos, chicken broth, and garlic cloves in a saucepan. Cover and bring to a boil. Reduce heat and simmer gently until tomatillos are soft, about 10 minutes. Transfer hot mixture to a blender/food processor - I used my handheld immersion blender right in the pot. Add green onions, cilantro, and serrano chile and blend mixture to a coarse puree. I could have eaten this whole pot of sauce with tortilla chips! 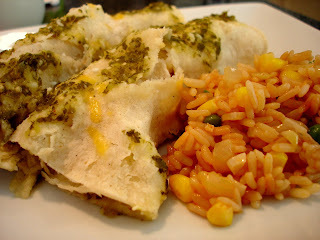 Chicken Enchiladas - once the sauce was made, I made things up as I went along. I usually make enchiladas with a lot of veggies, chicken, a creamy sauce, and red sauce for the top. I changed things up just a bit tonight. Heat olive oil in a pan. Coat chicken with the spices - the amount is up to you. Saute the chicken until done, and then either finely chop or shred it. Heat olive oil in another pan. Add red, green, and jalapeno peppers; saute for a few minutes. Add cream cheese, stir until creamy. Add just a few pinches each of the shredded and powdered cheeses. Next, prep the corn tortillas. I haven't had much luck working with corn tortillas in the past, so today I spoke to the owner of the Mexican market for some advice. The key to rolling corn tortillas is to make sure they are moist and warm, otherwise they will crack and fall apart. One option was to heat vegetable oil in a pan, and then cook the tortilla in the oil for about 30-45 seconds on each side. I did this with one and while the tortilla was very easy to work with, it was just too greasy for me. The second option was to wet the tortillas, place them between damp paper towels, and heat in the microwave for about 45 seconds. Once removed from the microwave, it is important they be kept warm and moist (under wet paper towels) while you are preparing the other enchiladas. This was the option I chose and while it worked, they were still a bit hard to work with - they became very flimsy and fell apart easily, but they did not crack. At least they held their shape in the oven. Putting it all together.. Now you have an assembly line of ingredients to make the enchiladas: moist/warm tortillas, cooked chicken, warm pepper/cream mixture, tomatillo sauce, cheeses. 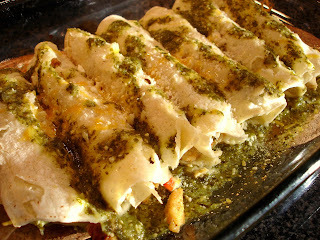 Pour a small amount of tomatillo sauce into your baking dish to keep the enchiladas moist and from sticking. Put one tortilla on a cutting board and top with some chicken, creamy pepper mixture, and a small spoonful of the tomatillo sauce. Roll the tortilla and place in the baking dish with the seam down. Repeat, putting the enchiladas very close together in the baking dish in order to help keep them closed. Once all of the enchiladas have been rolled and put into the baking dish, top with more of the cheeses and tomatillo sauce. Bake on 375 for about 25 minutes. I added a bit more sauce halfway through the cooking. The tortillas came a bit too moist, but were still wonderful. The tomatillo sauce had a serious kick from the serrano pepper, and the chicken mixture was nice and creamy. I can't wait for leftovers tonight! 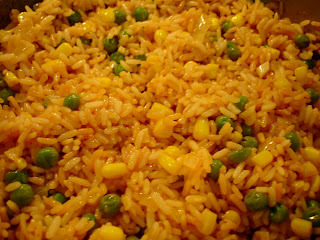 I gave Jon the task of making the Mexican rice from another recipe I found for Mexican Confetti Rice. ADDITIONS: a few dashes each of chili powder and cayenne pepper. Heat oil in a heavy large pot over medium heat. Add rice and stir 5 minutes. Add broth, tomato sauce, and salt; bring to a boil over medium-high heat and boil uncovered until about half of the broth is absorbed, stirring often, about 10 minutes. Mix veggies into rice and cover pot tightly with a lid. Reduce heat to low and cook until rice is tender and liquid is absorbed - about 10 minutes. Remove from heat and let stand covered 10 minutes before serving. I was happy with the flavor and would make it again. Next time I'd also add finely chopped red pepper for some flavor and color. This rice was much better (and better for you) than the boxed Goya Mexican rice that we have eaten in the past. Happy Cinco De Mayo.... You HAVE to go check out my blog and see the awesome cooking one I read that a couple of my friends started... Chop.Stir.Mix. They are having an awesome contest! This looks so delicious! I miss mexican food so much in Japan!